Description: The Great Plains wolf is the most common subspecies of the gray wolf in the continental United States. A typical Great Plains wolf is between 4 ½ and 6 ½ feet long, from snout to tail, weights from 60-110 pounds and may have a coat of gray, black or buff with red-ish coloring. Range and Habitat: The historic range of the Great Plains wolf was throughout the United States and the southern regions of Canada. It is currently found in the western Great Lakes region of the United States and Canada. North and South Dakota officials have noted lone wolves, but evidence indicates that the wolves were dispersers from populations outside the Dakotas, and that a breeding population probably does not exist there. 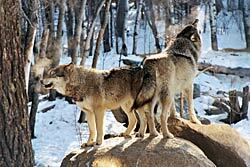 Average pack size for the Great plains wolf is five to six wolves. Diet: The typical prey for the Great Plains wolf consists of white-tailed deer, moose, beaver, snowshoe hare, and smaller birds and mammals. Conservation: By the 1930's, Great Plains wolves were extirpated almost eliminated completely, in much of the western United States. In Wisconsin and Michigan, the Great Plains wolf was eradicated by the mid-1960's. 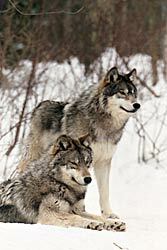 Only a small group of wolves survived in northeastern Minnesota along the Ontario border. In 1974, the Great Plains wolf in the Great Lakes region became fully protected as an endangered species. By 1978, Minnesota's wolf population had increased enough that the wolf was reclassified as threatened in Minnesota. The Great Plains wolf is found in the Eastern distinct population segment (DPS) categorized under the Endangered Species Act. In 2007, this DPS was removed from the endangered species list. The estimated population for the Great Plains wolves for 2006 in the United States was over 3,900 wolves.